Over the past few months I've been faced as a leader with having to make some tough and very unpopular decisions. Here, distilled from several sources, are reminders for us as leaders when confronted with hard choices. 1. You were put in a position of leadership for a reason. 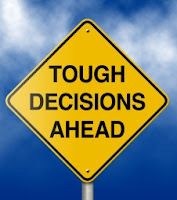 You are responsible to make the tough decisions, so make them. 2. If being a leader was easy, anyone could do it. You're a leader and a decision maker because of your knowledge, insight and skills. 3. If you find yourself delaying a tough decision realize that you are likely making the situation worse. Think about the consequences of indecision. 4. Listen to your inner voice telling you what is the right, rather than the easy thing to do. 5. Accept that the right decision is likely to be unpopular with some people. Remember too, it will likely be a relief for others. 6. Ask yourself "what's the worst that could happen?" Can you and the others you lead live with that? 7. Trust in God's ability to guide you in making the right decision.